The plight of Haitians in the wake of the earthquake is heart-wrenching in the extreme. These long-suffering people must now endure even greater hardship. It doesn’t seem fair, but life rarely does. How can those of us who are more fortunate in other parts of the world assist them? I first found out about this orphanage because they had built an earthbag house and were promoting this ecological way of building. You can see a description of this at earthbagbuilding.com. There are many reasons to recommend earthbag building in this impoverished country, and resistance to seismic events is among them. Just how resistant earthbag housing might be to earthquakes is not known for sure. Very little testing has been done to prove this one way or another. This initial seismic tests done at CalEarth and other places are encouraging, but not conclusive (see earthbagbuilding.com/testing). Some members of Engineers Without Borders are currently gearing up to do some more testing, so we will hopefully know more in awhile. This technology is still in its infancy, so there is much more to learn about its potential. Earthbag housing can be used for emergency shelter, and we have posted a number of possible options at earthbagbuilding.com/emergency, including one proposal that Dr. Owen Geiger and Patti Stouter assembled to present to the UN. This sort of emergency housing has the advantage over tents and other immediate structures that it can often be used and improved over time to become more permanent. Another kind of housing that can withstand practically any sort of catastrophe are shipping containers that are converted to dwelling places. These steel shells have become surplus items at many ports around the world because of trade imbalances. There have been some very innovative designs for incorporating these modular units into quite livable spaces (see an article I wrote at www.greenhomebuilding.com). I participated in assembling a proposal to the UN for arranging this concept to be employed in Haiti. Here is another proposal in the same direction: www.clemson.edu . Such structures do need to be insulated to make them livable in most climates, but this is possible and can be done with earthbags filled with a variety of materials. I agree with you that in some ways the devastation in Haiti does present an opportunity to rebuild with green sustainable principles, and I hope that this can be manifested. We each can do our part. Of course you could also think of building with straw bales as this testing has been done by the PAKSBAB organisation after the earthquake in Pakistan.. Cheap, easy and very durable in especially in earthquake and extreme weather regions. I don't believe that strawbales are generally available in Haiti, which means that any that are used would have to be imported. Earthbags have the advantage of using mostly local, inexpensive materials. We are working on some simple earthbag designs that are engineered for quakes, and I'll post more about this as it becomes a reality. Many thanks to Rosana Hart for pointing me in this direction via a private message received tonight at the Warrior Forum. And warmly invite anyone who wishes to be involved to visit that site and contact me as soon as possible. With just four months to go before the hurricane season kicks in properly, there is a very, very urgent need now for the provision of hurricane proof, warm, dry and secure housing in Haiti. With tens of thousands at present living in tent cities, these polythene tents are going to be next to useless, if and when a major hurricane strikes. Haiti Housing is seeking to do it's small part to give some dignity and safety back to some of the most vulnerable residents of Haiti. 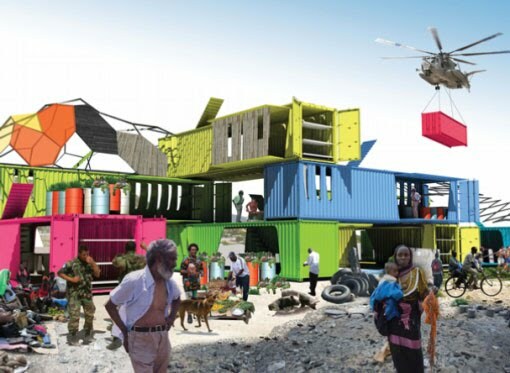 The aim at Stage One is to convert 25 shipping containers into homes to provide sleeping / cooking quarters for 450 people. Please help us to get this project off the ground as quickly and effectively as possible! I will of course be delighted to link to other projects endeavouring to assist the people in Haiti.